But American canned beer? Bah! Once again, I am so happy to be proven wrong. On every trip home to Minneapolis for the past few years, I have been tempted to tour the Surly Brewing Company in Brooklyn Center, MN. The name of the company alone was enough to intrigue me, but then I got a load of the beer names: Furious, CynicAle, Bitter Brewer, and Bender. Just add Grumpy, Sleepy, and Dopey and they could be the Seven Drunk Dwarfs of beerland. I figured a company that creative with their names had to produce good stuff, and I was right. We had our first taste of Furious on tap at Bryant Lake Bowl -- a bowling alley/restaurant known for its bowling, local food, and wide range of beers -- and loved it. It was big and hoppy and reminded us of Racer 5 IPA and is got its name because: "This is the beer that would come to mind while spending the last two years tearing down walls, hanging sheetrock, moving kegs, power washing the ceilings, arguing with various agencies, and cutting the water main." Next we tried CynicAle, which had been heroically and specially procured for us by my friend's husband in the middle of a dinner party all because my friend knew we were on a Surly hunt. Described as, "Brewed with Belgian malted barley, this copper hued ale is brewed in the Belgian Saison style. A unique Belgian yeast strain creates the spicy flavor and imported hops lend the apricot/peach aroma...You know summer in Minnesota is here when Cynic is around," CynicAle was another canned winner. Finally, we grabbed a four-pack of Bender. Bender is made up of five malts -- two of them from Belgium -- which are supplemented by oatmeal "to give it a smooth texture not usually associated with this type of beer." It was lovely; rich, chocolately, Guinness-like but with its own distinctive edge. Knowing that beer snobs like me might turn up my nose at cans, Surly has a list of reasons why they can it. My two favorites are, "Cans are cool" and "Throwing them at the band will not hurt them." "In 2005, Omar & his wife Becca headed out to Portland for a weeklong beer drinking trip. On the flight out, Becca came up with the name Surly. The name was a reaction to the question posed: "How do you feel when you go into a bar and there is no good beer?" Answer - You Get Surly, and say "Let's go to another bar that cares about decent beer." 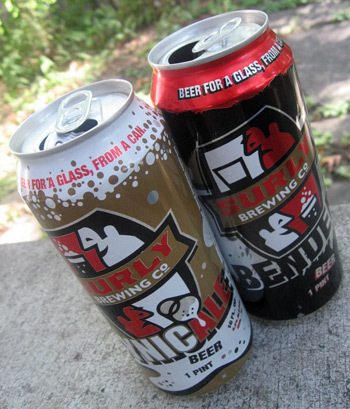 Surly: The anger fueled by the inability to find good beer." We actually had hopes of bringing some warm Surly cans home with us to enjoy in the San Francisco summer months of September and October, but because it's not filtered or pasteurized, Surly must always be kept cold. I'll tell you this, I'm getting pretty Surly that I can't get me some CynicAle for election night in San Francisco.